The group signed to MCA records and released Leather Boyz with Electric Toyz, an album whose very name was a tongue-in-cheek tip of the hat to their glamorous heroes – Sweet, Kiss, the NY Dolls – all the bands who believed that rock music wasn’t just music – it was a show, a spectacle, a lifestyle – “a prostitute to be trumped up and tarted around like a band aid or cheap whore” – to borrow a quote from David Bowie. The Howard Benson-produced album made a significant impact, being named one of the hottest albums of its genre by Metal Edge and Spin magazines. Pretty Boy Floyd landed on the cover of metal bible Kerrang! and their two Top 20 videos “I Wanna Be With You” and “Rock and Roll is Gonna Set the Night on Fire” hit MTV, back when MTV ran videos instead of reality shows. The band toured the world and was recognized as the kings of the Sunset Strip, breaking attendance records held by Van Halen and Warrant. Their album would go on to sell 750,000 copies worldwide. As the new millennium rolled in, new music fans began to wonder what they had missed. While most Pretty Boy Floyd fans were at an age that you wouldn’t commonly associate with concert goers, a whole new breed of young fans who weren’t even out of school when the band first emerged began to rediscover their music. The original fans and the new fans meshed on their common ground – a love of Pretty Boy Floyd’s music, sleazy shows, and fun times. Never mind what the critics think, or what trends may have come and gone. 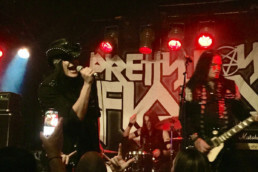 Having outlasted many of the critics who cried “they’ll never make it,” Pretty Boy Floyd continues to record and tour the world.